More than 170 dealers, partners, and stakeholders joined Samsung executives at the City of Dreams last May 25 for an evening of discovery, innovation and entertainment with the so-called “Archipelago: The 2016 Samsung Curved TV Dealer Launch”. With this, television technology has once again been elevated with the latest Samsung Curved TVs. “This launch is a significant step towards our goal of continuing to be the No.1 TV Brand in the Philippines,” President and CEO of Samsung Electronics Philippines Corporation Kevin Lee said. He also thanked the guests for their unwavering support. The star of the evening was the Samsung Curved SUHD TV boasting its Quantum Dot Technology and High Dynamic Range (HDR), which conventional TVs cannot replicate. The Quantum Dot technology gives viewers life-like color expression with up to 1 billion colors. HDR gives a wider range of brightness, allowing us to see even the smallest details. The Samsung SUHD Curved TV also features the new Samsung One Remote, an amazing upgrade to the traditional remote control that lets you control every connected device in your TV with just one remote. “The Samsung Curved SUHD TV merges innovative technology and elegant design to give viewers a TV experience like no other. 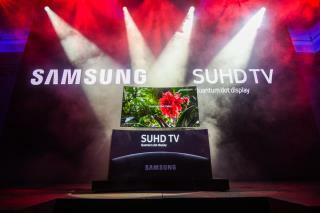 This is how Samsung redefines the way we view TV,” Jun Guevara, Head of Product Marketing of Samsung TV, added. The full line up of Samsung Curved TVs was also showcased during the event. From Curved UHD TVs that have real 4k resolution to Curved Full HD TVs which are more affordable allowing more people to experience this innovation. 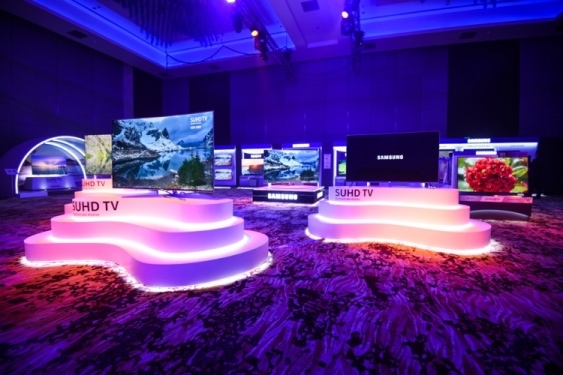 Guests were also the first to see the HyperTV, Samsung’s line of TVs with removable stands, front firing speakers that deliver better sound clarity, and All Care Protection that protects the HyperTV from insects, virus, dust, lightning surge, electrical surge and humidity. The launch also showcased Samsung’s newest next-level audio products, the Curved SoundBar and WAM 360, which ensure balanced and superior sound quality. Also in attendance were Samsung executives Vice President of Consumer Electronics Jun Filart, Head of TV and Audio Gally Chua, Business Manager for Audio Visual Chris Choi, Head of Trade and Marketing Jupiter Guibone, and Regional Sales Director for TV and Audio Binggoy Mauricio.